Once in a while, a very special stuffed animal comes along - one that becomes a magical friend for your child. Big Zi-Bo the Stuffed Panda Bear by Gund has all the special qualities needed to make him one very special stuffed friend. 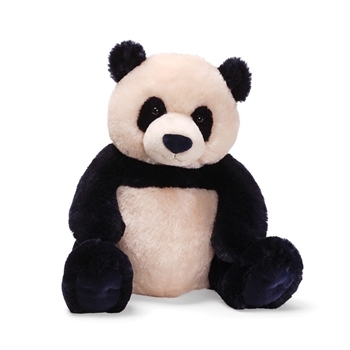 This big plush panda measures twelve inches tall sitting, making him an ideal size for snuggling and cuddling. Posed in the sitting position, Big Zi-Bo is just over twelve inches tall. Our big stuffed panda bear is made from the finest quality plush polyester blend fabric for a soft, luxurious heirloom quality feel and is colored and styled for a realistic appearance. Gund has been making quality stuffed animals for over 100 years, and just like all of Gund's quality plush, Big Zi-Bo the Stuffed Panda Bear is made of all new kid friendly material and meets or exceeds all US safety standards. We suggest surface washing for this big plush panda; recommended for ages one and up.